What’s the French for “I was wrong”? Every morning I try to come up with a new idea to blog about. Sometimes I’ve already been turning an idea over in my head for a day or two, other times I have to spend hours scouring websites and watching various sports channels to try to come up with a good idea. The challenge is coming up with an original angle, something to give my readers that is new and different. Often this means avoiding topics that the mainstream media is all over. But how can I avoid talking about the Montreal Canadiens' incredible 2-1 Game Seven victory over the Washington Capitals last night? I’m glad that I didn’t commit any kind of National Hockey League post-season because I would have never picked the Habs to better the Capitals. In fact, if anything, I would’ve picked top-seeded Washington to sweep Montreal right out of the playoffs. I had figured that although the combination of Jose Theodore and Semyon Varlamov has been a shaky goalie-by-committee for the Caps all season, they were no worse than the netminder hydra of Carey Price and Jaroslav Halak. Surely, Montreal’s pop-gun offence would’ve been no match for the Washington juggernaut. The Canadiens had no corresponding Mike Green. No Nicklas Backstrom or Alexander Semin. And Alex Ovechkin? He was several tiers above any forward the Habs have on their payroll. Heck, months ago I claimed that general manager Bob Gainey’s sudden departure from the Habs would prove to be a distraction for the seemingly playoff-bound franchise. Well, I’m not too proud to admit that I was wrong on all counts. 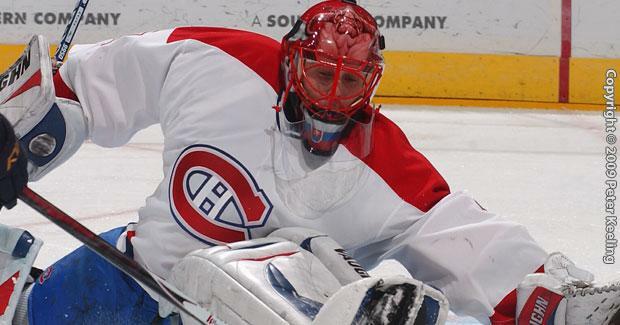 Halak, of course, was money for Montreal in the final games of the series. He stopped just about everything that came his way and stymied the league’s best offence. Speaking of stopping shots – Hal Gill, Josh Gorges and especially Jaroslav Spacek put their bodies on the line shift after shift, cutting down passing lanes and blocking half of Washington’s chances. All that defensive effort created tons of opportunities for Mike Cammalleri, Scott Gomez and Brian Gionta. Although all three are often maligned for being relatively short (Gionta is the shortest at 5’7”) they stood tall for the Canadiens and provided a crucial spark for the Habs. Now Montreal is taking on the Pittsburgh Penguins, the defending Stanley Cup champions, and again they’re big underdogs. I want to count them out again, say that there’s no way that their sound defensive system can create back-to-back upset. But hey, I’ve been wrong before.